If there is one thing the team at Women’s World Banking knows after years developing financial services that work for women in various parts of the world, it is this: even the best-designed, best-researched plans can run into a bit of trouble during implementation, especially when it comes to product innovations. Vigilant monitoring agility and the flexibility to respond to changing conditions are critical if one is to successfully launch a new project. All of these were true during our team’s recent monitoring visit to SEWA Bank in India. 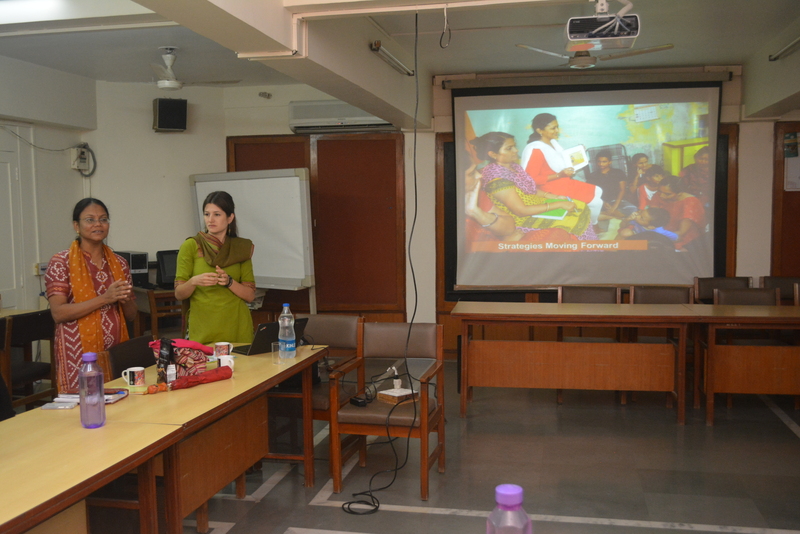 Earlier this year, we piloted “Tejasvi” (‘bright like a star’ in Gujarati), a savings and financial education program with SEWA Bank in Ahmedabad, India supported by Credit Suisse (we have written about the kick-off, research and product training on our blog). Project lead and Savings Specialist Ryan Newton had been in close and regular contact with SEWA Bank’s project liaison throughout the pilot to support with performance management, coordination, and troubleshooting. However, halfway into the pilot, progress was not on par with targets, especially with account uptake and financial education participation. SEWA was committed to the project and we were ready to understand the barriers they were facing. Beta testing any product is an iterative process and these adjustments are not uncommon. “Tejasvi” is a savings account that was designed around financial education. Youth participate in a six-session financial education course wherein they would learn about the importance of saving, open an account with SEWA Bank, and learn to use and save in the account as they continued with the course. And this worked! Together, both pilot branches (one urban, one rural) had high conversion rates of youth who took the financial education trainings and opened an account, higher than our expected 50%. So why were the branches, especially the urban one, not meeting their targets? Junior Financial Counselors. We were testing the type of financial counselor (FC) profile that would be most effective when serving youth; thus, SEWA Bank hired a Junior FC to deliver financial education at the urban branch, with the idea that girls would relate more to someone closer to their age (the rural branch was not able to identify any junior FCs and depended on its existing, more experienced staff). As Ryan described in her last blog, the less experienced junior FC was not as effective in convincing mothers to allow their children to participate in the financial education training and to open accounts. Despite extensive training, she was not as comfortable positioning the account and managing common misunderstandings, such as how the account is different from the bank accounts that are opened for youth to receive government scholarships. And as we knew from our initial customer research, mothers are an important gateway to the financial inclusion of girls, so the success of recruitment depended on convincing the mothers that a bank account was beneficial. At the rural branch, recruitment and training was more successful as it was conducted by an experienced, adult staff member whom mothers already knew and trusted. This staff person was also more familiar with the community and was more effective at outreach. With this information SEWA Bank decided to assign a more experienced FC for the remainder of the pilot. This FC accounted for most of the branch’s opened accounts during the pilot. Lesson: for the clients of SEWA Bank, trust is important and mothers are more likely to trust staff they already know. Having a young, unknown FC recruit and train their children about money and saving was not a convincing proposition. Time constraints and high opportunity costs. During the pilot, FCs also found that urban youth faced time constraints for participating in the full six-session financial education course, as they had to also complete homework and help with household chores and their mother’s income-generating activities. Based on this feedback, we condensed the financial education curriculum and refined the account opening and deposit collection operating model to meet these time constraints. Lesson: during a pilot, continuously monitor and refine the financial education delivery model to ensure it meets the needs of the clients while still meeting the objectives of the program. Finally, to help ensure that pilot targets were met, we worked with SEWA Bank to plan a seasonal promotional event at one of the urban schools. This event coincided with Rakhi, an important holiday in India where brothers and male relatives give girls money to celebrate the love and duty between brothers and sisters. SEWA Bank gave financial education sessions in schools and encouraged youth to save their Rakhi funds in Tejasvi accounts. This experience with Tejasvi showed how important constant monitoring and troubleshooting can be during a pilot. Apart from SEWA Bank’s commitment to serving the women and youth in their community, what was incredible for me to experience was the SEWA Bank team’s frank and sincere willingness to discuss their challenges, listen to best practices from each other, and enthusiastic response in implementing new strategies to achieve the goal. Those are the kind of people you want on your team and we are privileged to have such an incredible institution in our network. We look forward to sharing the results of the pilot evaluation in a future blogpost.